Some books are meant to sweep readers away into another world where they can live another life. Then there are those books that exist on a different plane where the concepts are foreign and bizarre and it takes hundreds of pages to start understanding what is actually happening. Existence is one of those books. If I were to compare it to other books I’ve read I’d call it Cloud Atlas meets Ender’s Game. It is similar to Cloud Atlas because it combines a handful of storylines that all have a few sparse threads in common. The characters come from vastly different walks of life and most of the interest lies in trying to figure out what’s actually going on. It takes hundreds of pages to find links between the different storylines. It resembles Ender’s Game, not in the edge of your seat thrill ride, but the way that the author introduces his philosophies and ideas about the vast unknown. To be fair, I haven’t finished reading Existence, yet. It’s long and requires focus and persistence to keep going forward. I can see why many people recommend it, Brin possesses a deep understanding of his world and a keen intellect which is demonstrated in the distinct characters that each play a role in the story. Do I like it? Yes and no. Yes, the world is fascinating and I really want to see what will happen. I like the questions it asks about the nature of existence and the possibility of life on other worlds, and how to communicate with said life. And no, it’s slow going and almost too intellectual to be a read in a way where the reader can feel truly immersed. The story is so fractured among the different characters that the reader only gets a taste of what’s happening before being shoved somewhere else. To fracture it even further, between each chapter are different seemingly random essays on different facets of existence, discussions between scientists, or meandering thoughts of an autistic person. I’m looking forward to finishing, nothing would make me happier than for the story to unfold into a brilliant and hard-hitting climax that gives the reader what they came for! Have you read Existence? Come share your thoughts in the comments! 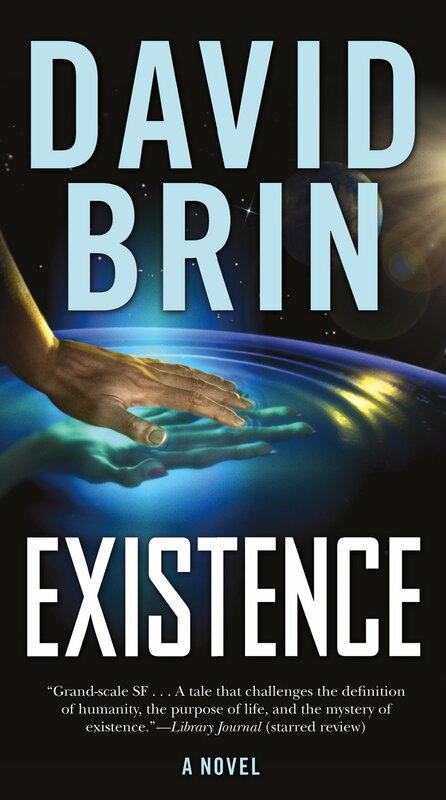 This entry was posted in Book Reviews and tagged aliens, book review, David Brin, Existence, nature of existence, science fiction, space travel by Jodi. Bookmark the permalink.